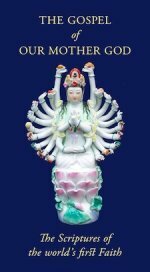 We have had some discussion on the devotional use of pagan Goddess images as opposed to canonical images from living traditions, such as those of Kuan Yin, Sri Lalita or the Lady Mary. In order to avoid confusion it is necessary to attempt to clarify what exactly is meant by a pagan goddess and by the term paganism. The term is used in a variety of ways, from being an insult used by Christians against non-Christians, to being a self-designation used by a variety of people. The term "pagan" comes from religio paganus – a Christian coinage meaning the religion of the country people, or rustics. It was intended to imply that those who adhered to the older religions were ignorant bumpkins, out of touch with the more sophisticated ways of the Christianised cities. It was an adaptation of the Jewish term "Gentile" as a name for the unbeliever or outsider. The Emperor Julian (called by Christians "the Apostate"), who sought to restore a form of traditional classical religion certainly did not think of himself as a "pagan". Currently the word is used in a variety of senses. Some old-fashioned Catholics use the term to mean any non-Christian, including atheists and agnostics. Fundamentalist Christians often use the term to mean any religion outside the Abrahamic group of Judaism, Christianity and Islam. A more usual usage would be to apply it only to religions outside the major world religions, or only to ancient and currently defunct religions (or those that exist only as "revivals" with no continuous tradition, such as modern Druidism). Among Traditionalist writers, the term "paganism" is used to refer to a religious tradition whose spiritual "core" has become radically weakened or lost altogether. Historically, this has normally happened because the tradition has been "left behind". That is to say, it belongs to a previous Era and has not been able to make the necessary adaptations to make it workable in a later era. It need hardly be said that we are not here espousing the ideology of "progressism". As we know, this Kali Yuga is the last and lowest of the World-Ages. While material and technical acumen have risen, the spiritual and truly Intellectual capacities of maidenkind are lower than ever before. It is precisely because of this that periodic adaptations are required to bring traditions within the reach of a diminishing human capacity. In most cases adaptations take the form of a simplification and "economisation" of earlier traditions. Older traditions have a deeply complex symbolism and ritual which needed to be progressively adapted to a simpler and more sentimental humanity. There is nothing wrong with our current simplicity. It is the nature of the Age. Once we understand this we begin to understand that pagan Goddess images, from extremely ancient times – when feminine imagery was the only divine imagery – to the paganism of classical times, may in fact be beyond our capacities to fully comprehend. With the arrogant "progressism" of their Age, modern people are apt to look upon pagan goddess images like that of the 30,000 year-old "Venus of Willendorf" [left] as the product of a people far less sophisticated than ourselves. The exaggerated bodily femaleness is seen as something we can easily understand and associate with concepts of physical "fertility" that fit in readily with our own materialistic view of life and nature. However, if the traditional doctrine of the Ages has any validity, these figures were made by people vastly our superiors. It is probably pointless for us to speculate on the precise meaning of the bodily symbolism; but it may help to shake our ideas back round the right way if we consider that, rather than being the work of a people just emerging from animality, these earliest pagan goddess images are the work of people who are emerging (or descending) from a much more spiritual level of existence. As these images are being created, the connexion of maidenkind with with the material plane is just becoming strong enough for her to make images of a physical nature and to recognise the symbolism of the physical body. These earliest pagan goddess images are themselves the product of a downward adaptation from a stage of human descent too high for us to have any conception of. Just as Stonehenge was once thought to have been the work of some ignorant rock-hauling savages, but is now known to correspond to precise mathematical calculations that have only recently become once again possible to understand with the use of modern computers, so such pagan goddess images as the "Venus of Willendorf" represent something far beyond our understanding. That these honoured foremothers were worshipping Dea we may know. But what form their worship was taking, so many "adaptations" above our current level, we cannot know and would be very unwise to try to guess. If we are attracted by these earliest pagan Goddess images, we are likely to be attracted for very much the wrong reasons. But what of later pagan Goddess images? As Miss Niobe pointed out on our page on Goddess Images much about these traditions is publicly available. We have ourselves devoted much of the work of this Chapel of Our Mother God to examining such pagan goddess images and explaining their relevance to our current worship and understanding of Dea. Nevertheless, these are pagan goddess forms in the sense of belonging to defunct traditions. The modern mind, with its political and progressist perspective, is likely to say "but aren't they only defunct because the Christians won?" The answer is in fact the reverse. The Christians won because paganism was already defunct. It was a religious system only half-believed, if believed at all, by most of its followers. It had degenerated into mere civic ritual and the legends of the gods and goddesses seemed to represent them as something little above human beings (indeed, in their moral behaviour, often below them). Hinduism adapted its "polytheistic" religion into forms that preserved its real spiritual meaning for the current World Era. The related traditions of Europe – by that time a far more worldly culture than that of India – did not, and thus degenerated into what can properly be termed a "paganism". The result was that the vital and fully-adapted spiritual movement called Christianity, from another part of the world, became dominant within a few short centuries. Even the Emperor Julian, when trying to re-establish the classical religious tradition, realised that it would need a radical reformation in order to become once again a living spiritual force. However, he was assassinated and no such reformation ever took place. And yet, as we have pointed out in our page on Lady Mary, the image of Our Mother God reasserted itself in the Christian world with many of the symbols and titles associated with the pagan Goddess figures of the West. That imagery returned, in some early cases, because the traditions of Our Mother God were being consciously used by Christians to attract Her former devotees. But many of these "pagan" accretions came much later when Christianity was dominant and classical religious tradition largely forgotten. Why, then did they re-emerge? They re-emerged because symbolism is a living reality. An Image of Dea will take on the proper symbolism for the same reason that an oak tree will grow acorns and not pears. Her Image is an organic reality rooted not in the earth but in the Heavens. Images of Our Lady have a proper symbolism. That symbolism corresponds to a cosmic reality. We cannot just make it up. It resides in the very nature of being. An ancient image, such as the "Venus of Willendorf", does not belong to this World-Era. It will not be spiritually effective for the present humanity. It is not only that we shall misunderstand it (as we certainly shall) – understanding is not always necessary for a ritual to be effective. It is that its spiritual efficacy is not adapted to either the terrestrial conditions or the human psyche of this age. It cannot be the cause of a true darshan. With classical images, we are much closer, but still not close enough. As angelic images (seeing the martial Athene as Sai Vikhë or Aphrodite as Sai Sushuri) they may be adequate and beautiful and are indeed recommended; but for a plenary image of Our Mother God it is necessary to have a canonical image fully adapted to the conditions of the present age (by which we mean the last millennium or so – not the follies of the recent west). No human mind can devise the symbolism of Dea. The living nature and supernatural origin of Her Images are attested both by their continual re-emergence – even in contexts where the official theology cannot truly support them – and by their frequent supernatural manifestation (see our page on Rangjung). We need a true grace-giving and spiritually-living Image as the proper and Providentially given focus of our devotion. 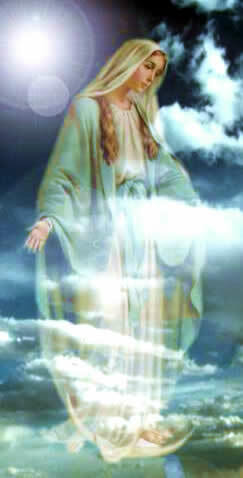 Thanks to the love and kindness of Our Dear Mother, we have never been left without such sacred and beautiful Images. Pagan Religion: What Is It? 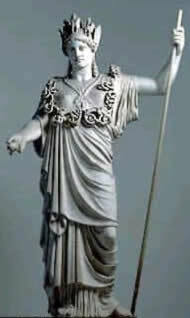 Send Questions or Comments on Do We Worship a Pagan Goddess?